Have you been spending a fortune on Grout Cleaner and breaking your back scrubbing your floors, or hiring companies to clean the grout on your floors and walls? 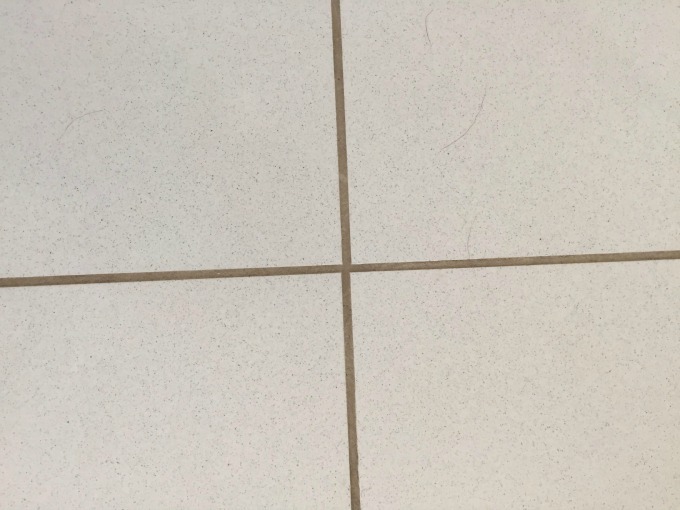 For years we’ve been a slave to our kitchen floor, hunched over for hours on end at least twice a year to scrub and clean our grout so it looks like new. Last year we even hired a company to come out to the house to clean the grout at the price of $500! We were so sick and tired of cleaning it we hoped they would do a better job. Unfortunately within the month the grout looked the same, and I found myself calling the company to come back to fix it – on their dime. I know having 2 dogs made it challenging to keep the floor pristine, but the grout started looking black instead of cream. 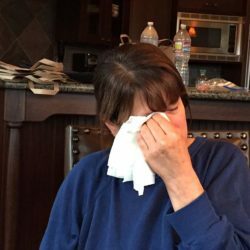 Plus lets face it, the kitchen is the most popular room in the house and right off the garage, so most everyone in the family would enter by walking through the kitchen. Any room with heavy traffic is bound to need more cleaning – right? Cleaning the grout on our kitchen floor has become a laborious task, but MUST be maintained on a regular basis. Heaven forbid if we cleaned it less than 2 times a year it would look revolting. Cleaning the grout more often would be ideal, but who can do that without hiring someone? I even purchased a steamer to try and maintain the kitchen floor, but that wasn’t working. So when I read about this Homemade Natural Grout Cleaner in The Magnolia Journal Magazine, from the TV personalities of The Fixer Upper, Chip & Joanna Gaines, I knew I had to try it. I figured I had nothing to lose. By the way, if you’ve never seen The Fixer Upper, and are fans of shows where they fix up old homes and turn them into luxurious abodes, you’ve got to watch The Fixer Upper. Plus Chip & Joanna are a fun couple with darling children. The show is fun, entertaining, and full of great ideas! 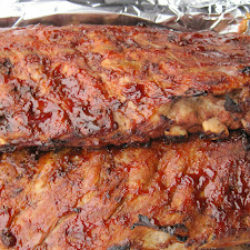 With just three simple ingredients – two I had in my pantry, and the other I found at Target. I couldn’t wait to go home to create this Homemade Natural Grout Cleaner and hopefully remedy my filthy grout. OMG! Literally it took all of 3 minutes to whip up the Homemade Natural Grout Cleaner in a container. Then I decided to use one of my squirt bottles for ease of dispensing the cleaner directly onto the grout lines – it worked perfectly! I put the ingredients in a container with a wide mouth and blended everything together until it was smooth. Then I poured that into the squirt bottle, and carefully shook the bottle with my finger over the opening so nothing would shoot out. After sweeping my floor to remove any debris, I took the squirt bottle using the grout lines as a guide, and squeezed the mixture in sections, leaving the grout cleaner to set and do the job for 15 minutes. With just a slight scrub with a brush, I then washed each line off with a wet sponge. To my amazement our grout looked brand new! For years we would use Soft Scrub with Bleach. Most recently I purchased Goo Gone for Grout but that did a marginal job. However, this concoction was unreal! My pictures don’t do the floor justice. When I exclaim the sections I did looked brand new – I mean it! I still despise cleaning the grout on our kitchen floor because it’s large. However, now I’m not dripping sweat, or end up with a sore back, neck, and arms – basically crippled for several days after. Instead, it’s a piece of cake! If you’re tired of searching for a grout cleaner that does the trick, look no further. I’m blown away at how incredibly clean my grout is now. I wish you could come over to see it. Of course, I haven’t finished my entire floor yet, but made an extra large batch to finish off the job – hopefully! 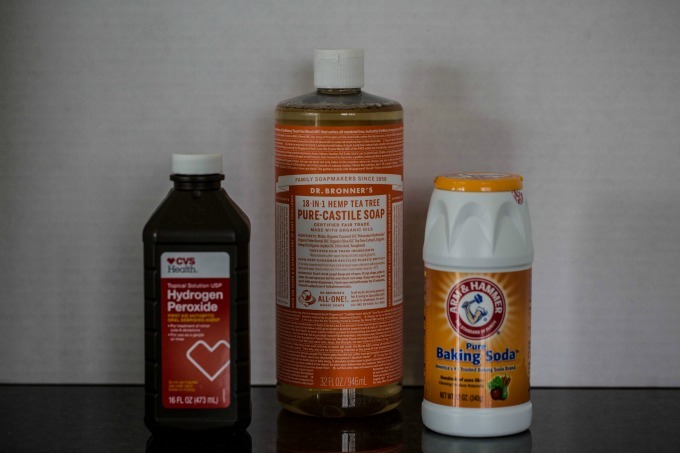 Tip: The recipe for Homemade Natural Grout Cleaner below is a basic recipe. Depending on the size floor, or wall you need to clean, will determine the amount to duplicate this recipe. I’d suggest starting with a small batch. If you’re as satisfied as I am with the Homemade Natural Grout Cleaner, then you may want to purchase the ingredients in larger quantities. 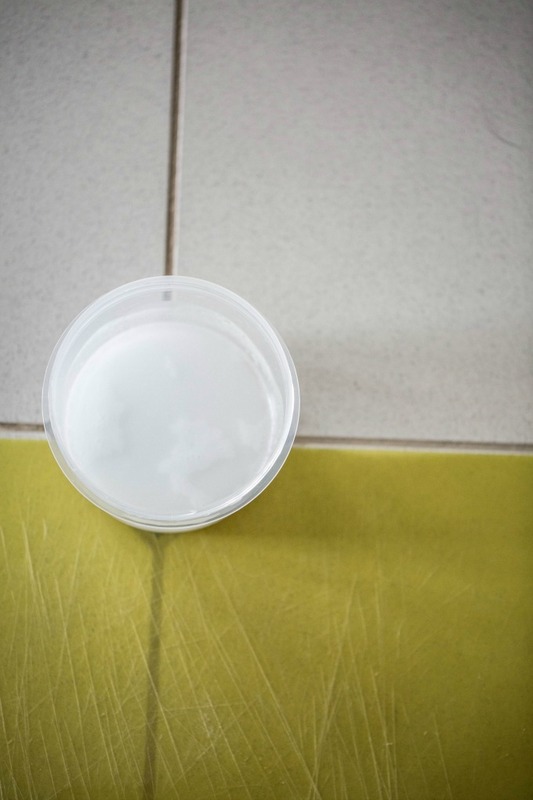 I hope you’ll share your comments below if you try the Homemade Natural Grout Cleaner on your floors and walls. I’m certain you’ll be blown away with the results, just as I am. 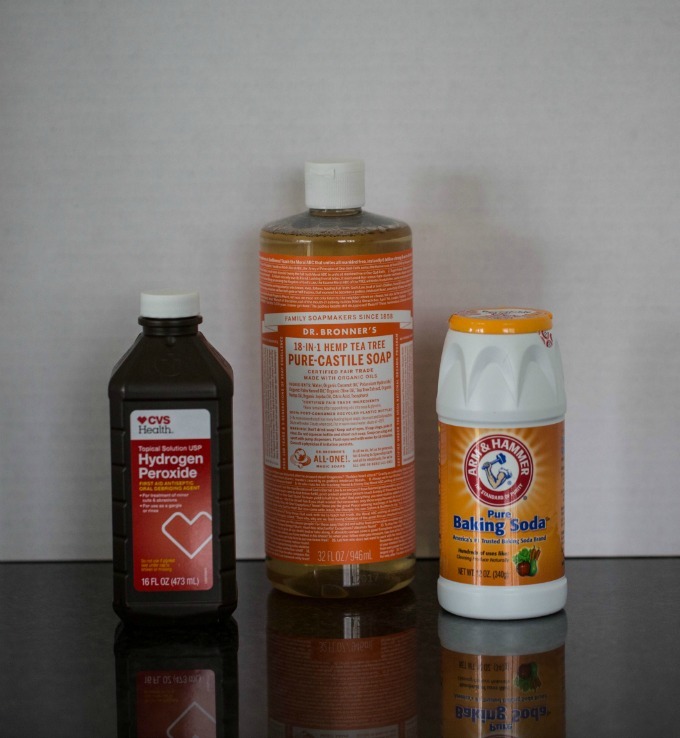 Do you have a proven method for cleaning your grout? If so please share in the comments below! Here’s the recipe for Homemade Natural Grout Cleaner…………….. 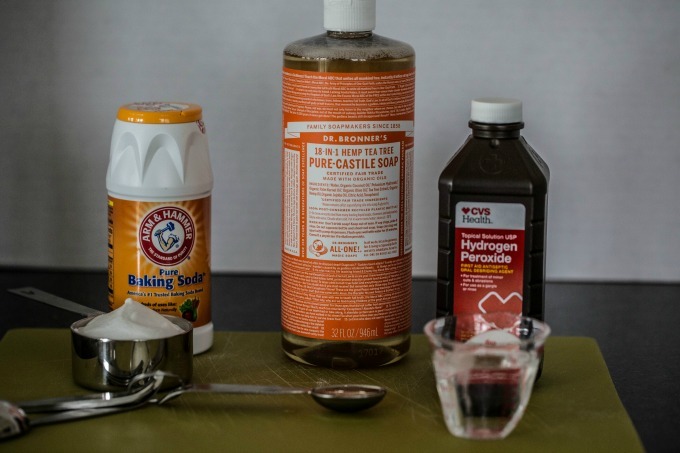 Try this Homemade Natural Grout Cleaner for the cleanest grout ever! Trust me, I've tried my share and slaved over my floor - but not anymore since I discovered this Homemade Natural Grout Cleaner! 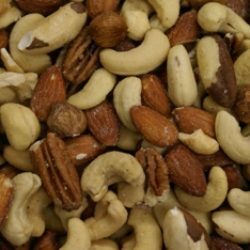 Mix ingredients in a resealable container. For ease of dispensing onto grout place in a squirt bottle. Shake well before applying onto grout. Leave on for 15 minutes or longer. Gently scrub with a brush or grout brush. Wipe off with a wet sponge. Note: Dr. Bonner's Castile Liquid Soap comes in a variety of scents. Choose your desired scent. Will any liquid soap work or can I skip it? I would think so. It said any natural liquid soap. The recipe isn’t a large amount to start with so try it with what you have. There was a list on the page clarifying things to keep in your pantry and it named Castile Natural Soap which is why I used that. Try whatever you like I don’t think you’d want it to be too sudsy otherwise it will take forever to get soap off the floor. Hope that helps. Yay! I have scrubbed grout until I’m ready to scream. The kitchen always looks dingy and it’s such a chore to scrub and scrub. I’ve just searched and found the castile soap in an organic shop not far from here. I have the peroxide and the baking soda so my grout is going to be really clean by the weekend. Thank you Maureen. Please let me know what you think. I was totally blown away by it. Who knew simple household ingredients could work magic on our grout? I’ll look forward to hearing your testimonial. It worked beautifully. I have clunky tiles with wide grout and I was concerned but not to worry. They’re not all done yet – most of the downstairs is tile because we live along a sandy canal. It’s a rolling project. Very cool! I will definitely try this. I’m all about homemade cleaners, they save so much money and work so much better. I make many of my own but have never done grout cleaner. Thanks! You’ll be amazed at how well this works and with little to no effort at all! Easy to find ingredients & it works great! Really interesting! Our grout is always getting dirty — have to try this. Thanks! Same here and we’ve tried I feel like everything. This worked better than anything we’ve ever tried IMO! 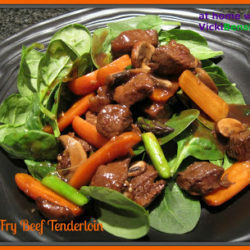 Thanks for the post Vicki…I am so going to try this…it sure looks great and simple. It is so great and easy. 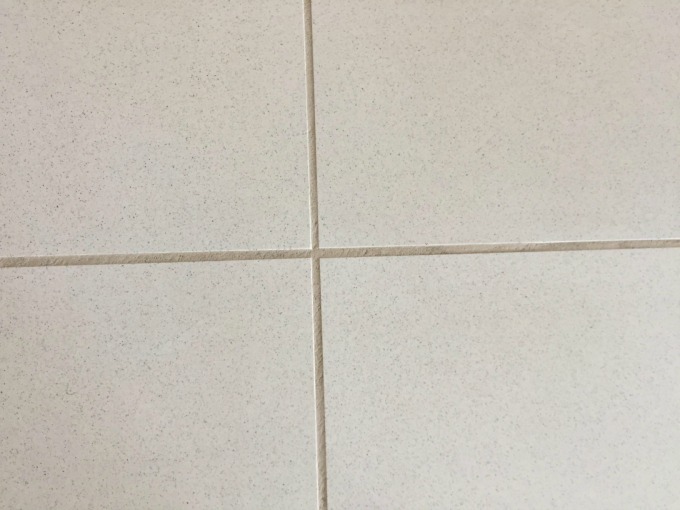 Crazy to think all these years we’ve been slaving over the floor and now this simple household remedy cleans the grout with little to no effort. Enjoy your week as well. This is something I can most certainly use! The grout in the sunroom needs a cleaning but I can use any of the commercial cleaners because of the chemicals. This is perfect! Thanks for sharing this!